Melissa Huggins joined Spokane Arts last month as the city-funded nonprofit's executive director. Part of Melissa Huggins' new job is explaining what exactly Spokane Arts is and what it does. That can be tricky, because the organization that Huggins is now director of is not actually a city agency, but it does receive funding and additional support from Spokane. In other ways, it's very much an independent nonprofit organization with a board to answer to, as well as oversight from the Spokane Arts Commission. Huggins took over the top job at the arts advocacy group in early December, and finds herself at the helm of an organization that recently secured additional city funding and is planning a new grants program at a time when she says the arts are taking off in Spokane. On the other hand, she is Spokane Arts' fourth director (including an interim leader) since it broke off from the city in 2012, with Laura Becker stepping down this past fall to take an arts administration job in Santa Monica, California. Huggins says those personnel changes weren't a sign of dysfunction, even if they didn't necessarily provide the best optics. Spokane Arts in 2017, she says, is as strong as ever. "It feels like a young nonprofit that feels like it's on the verge of being something really big," she says. In March, the Spokane City Council voted to allocate money from the city's admission tax — fees tacked onto sporting events, concerts, movies and other artistic events — to go to Spokane Arts. Estimates show the organization could get anywhere from $100,000 to $250,000 of the total admission tax collections. Huggins, who testified for the allocation at a city council meeting last year while still serving as the executive director of Get Lit!, EWU's literary festival, says the admissions tax will continue to be a boon for Spokane Arts to work as a vehicle to support artistic efforts in the city. "We are so happy and proud that the city council president did take such an active role in making the admissions tax ordinance happen," says Huggins. "Because it is a percentage, there is opportunity as the pot grows, ideally with our help drawing in more tourists and helping to build up the local arts economy, that our percentage of those funds will increase every year." Huggins is originally from Spokane and went to public schools here. 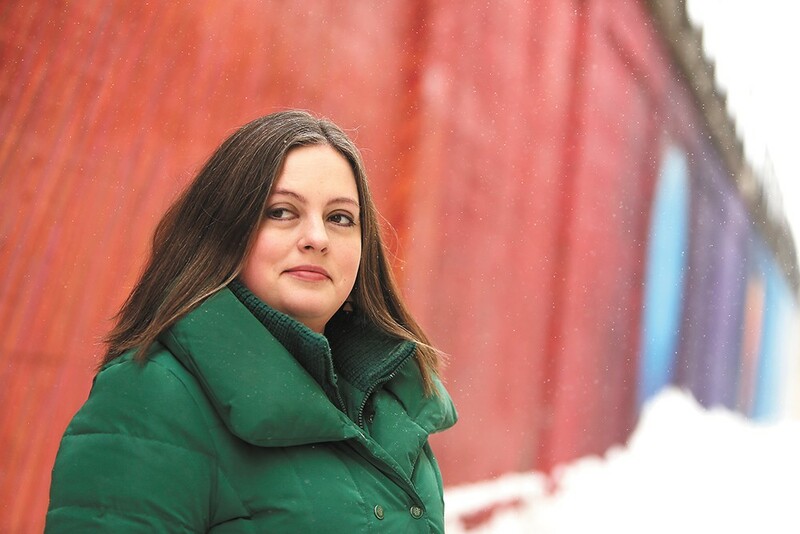 She returned after college and working for nonprofits in Tacoma to Spokane to enroll in Eastern Washington University's MFA creative writing program. After earning the degree, she became the director of Get Lit!, the university's literary festival, and has collaborated in that capacity with Spokane Arts in the past. In the past, Spokane Arts has been responsible for public art installations, a mural project throughout downtown and the opportunity for young artists to create art on the city's traffic signal lights on the side of the road, among other efforts. Now, Spokane Arts is in the process of handing out Spokane Arts Grant Awards (SAGA). The group says the grants are meant to "serve as a catalyst, fostering a robust, healthy arts community where individual artists, creative industries, and nonprofit arts and culture organizations, thrive." Applications for the first round of grants — which add up to $85,000 total — are due on Feb. 1. Huggins sees the grant program as a way for Spokane Arts to support artists and organizations that need a leg up in getting going, or perhaps the resources to take the next step. She also stresses that the grants are not just for visual artists, but creative types of all stripes. "The grants program is going to have a tremendous effect not only in helping artists have a basic level of support, but it can also benefit in so many other ways," says Huggins. "It can help legitimize artists or arts organizations by making them eligible for other grants and opportunities." Want to apply for a Spokane Arts Grant Award? Before you apply for a SAGA, head to spokanearts.org/awards and read the guidelines for the awards. Then, to take the next step, you're invited to a grant application workshop on Wednesday, Jan. 25, from 4 to 5:30 pm. The workshop is free, but you need to preregister at brownpapertickets.com. Search "Spokane Arts."